On September 2, at 10 o’clock in the morning, a group of 500 people who wanted to plant two thousand oak trees in the ecological reserve Quembó Cuxtitali, in San Cristóbal de Las Casas, were attacked with sticks and stones by inhabitants of the community of Molino Los Arcos, in the east of this same city, with a balance of several injuries. “They were more than a hundred people with their faces covered, armed with machetes, sticks, slingshots and other objects who were very aggressive. What they are looking for is to keep the 101 hectares of the reserve. Since 2016, the decree 516 grants its custody to the Autonomous water system of Cuxtitali neighborhood”, said one of the people promoting the reforestation in the area. The assaulted reported that the inhabitants of Molino Los Arcos took possession of the spring located within the Gertrudy Dubis ecological reserve illegally, since 1994, and that they have been cutting down many trees affecting the amount of water that reaches the neighborhood of Cuxtitali where many of the environmentalists came from. It is not the first time that an aggression of this type has been recorded in the area, in addition to the fact that the reserve has been set on fire at least four times. The government secretariat said it had warned the environmentalists that there were no conditions for them to try to reforest, but “they entered exposing civilians, which led to a provocation with the residents of Molino Los Arcos.” The assaulted ones presented a complaint for aggression and injuries before the Public Prosecutor’s Office of the State and hours later they carried out a public meeting accusing Marco Antonio Cancino González, present municipal president of San Cristóbal, for the aggressions because they consider that he is “protecting the invaders who are occupying the ecological reserves”. After the opening event in San Cristobal de Las Casas, the participants from the 45 dioceses of the country were divided into groups that met in different parishes of the diocese, some located in the city and others in municipalities such as Teopisca, Tila, Venustiano Carranza and Ocosingo. Representatives of the CEBs of Guatemala, El Salvador and Honduras also attended. At the end of the event, again in San Cristóbal, they issued a joint statement in which they proposed “to promote active citizen participation in this moment of profound socio-political change in our country”, after the electoral victory of Andrés Manuel López Obrador at the beginning of the month. They acknowledged that “we are at a key moment in our country, because in the past electoral process, the people decided to change the direction maintained during the last six years, which led to the concentration of the economy in few hands, structural reforms, the climate of violence and corruption, the interventionist policy of the United States as also happens in various countries. All of this represents, without a doubt, a great challenge for the citizens who have decided on a change “. Among other agreements, they decided to “renew our communities, accompany and include children, adolescents and youth; promote active citizen participation in this moment of profound socio-political change in our country and promote continuous, integral, social, political, testimonial, and shared formation that allows us to respond to the realities of today “; as well as to “deepen our historical memory as a source of life and hope; recover the role of the laity as subjects of the journey of our church and society; and resume and resignify our method: See, think, act, evaluate and celebrate “. On May 31, some 300 women, accompanied by several men, marched in San Cristobal de Las Casas, Chiapas to demand the cessation of femicides and gender violence. “More than a year after having declared the Gender Violence Alert in San Cristóbal, women continue in minimum security conditions that guarantee our lives and integrity,” said the statement read by the co-conveners. They denounced that in the last month there have been two feminicides in the City that remain unpunished. The first occurred on April 24 at the borders of the La Isla neighborhood and the neighborhood of Mexicanos: “a woman’s body was found, victim of feminicide, with signs of physical violence and sexual abuse, but the authorities have not applied a feminicide research protocol with a gender perspective and have not activated measures to identify her“. A second feminicide occurred on May 9 in the neighborhood of La Nueva Maravilla: “María de los Ángeles, a 14-year-old teenager, lived in the San José Buena Vista neighborhood, north of the city, and was a high school student at General Miguel Utrilla College, located in the neighborhood of Prudencio Moscos”. “The constant criminalization of the victims only perpetuates the violence that women live and it omits to point out the aggressors as violent and macho men. San Cristóbal, ‘magical town’, is not the exception “, concluded those who called for the demonstration. Just before the one-year anniversary of the forcible disappearance of the 43 students from the Raúl Isidro Burgos Rural Teachers College in Ayotzinapa, Guerrero, relatives of the disappeared have not ceased their efforts to have the events be clarified. 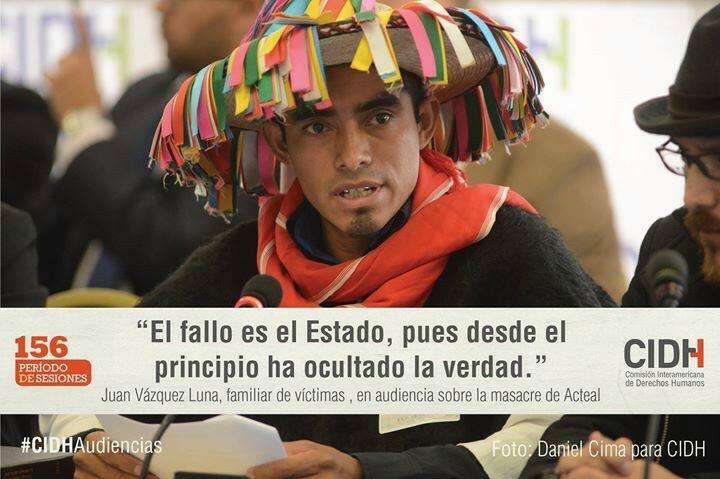 One of the principal points discussed at the meeting was the demand of the families to have investigations continue by means of a specialized unit for the case, as there is evidence of the participation of various police and Army units in the events that took place during the night of the disappearance. In this way, the president only offered to continue the search through the Special Prosecutorial Office for Disappeared Persons, a commitment that was rejected by the families, who considered it to have been insufficient. Moreover, the parents of the 43 also rejected the so-called “historical truth” presented by the administration, which was clearly repudiated by the presentation of the report compiled by the Interdisciplinary Group of Independent Experts (GIEI). They also reiterated that they would not give up in their struggle for the search for their sons, affirmed that they would continue to mobilize in Guerrero and Mexico City, and they called once again for support from national and international solidarity. For September 26, the day on which the one-year anniversary of the crime will be commemorated, there were several calls for actions in the country, as abroad. 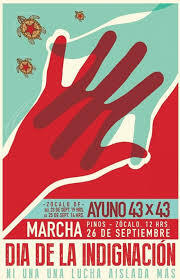 It was anticipated that in Mexico City, the families would carry out a 43-hour fast, declare the 26th of September a “Day for National Indignation,” and carry out a march to demand justice. 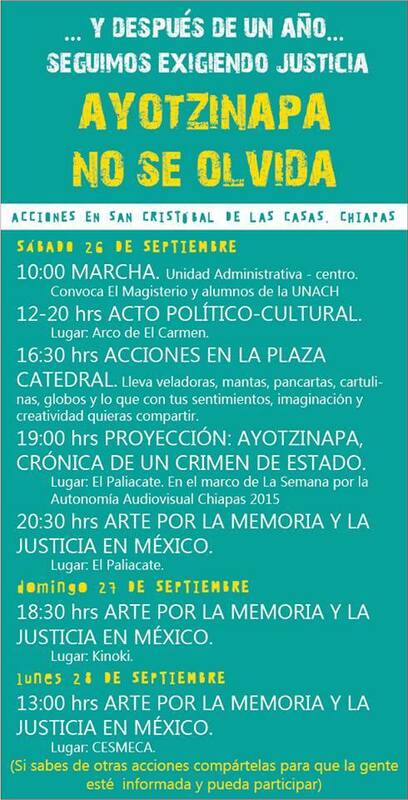 In San Cristóbal de Las Casas, Chiapas, there were also plans for a march, as well as for a cultural event to educate and express solidarity.